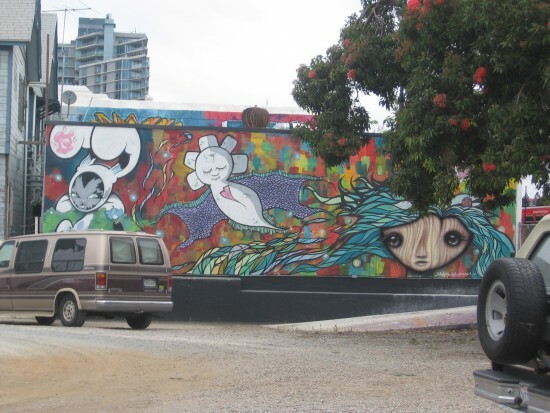 street art – Page 26 – Cool San Diego Sights! 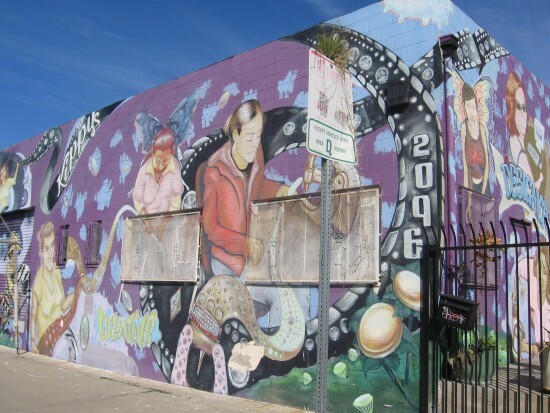 Cool mural on Kippy’s building in Barrio Logan. Huge mural on Barrio Logan Kippy’s building. I recently walked around Barrio Logan to take photos of street art, including the famous murals in Chicano Park. During my fun adventure I passed this building. I looked at Google Maps and believe this is or was the location of Kippy’s, a fashion design business that has a store in Coronado. Corner of cool Barrio Logan Kippy’s building. 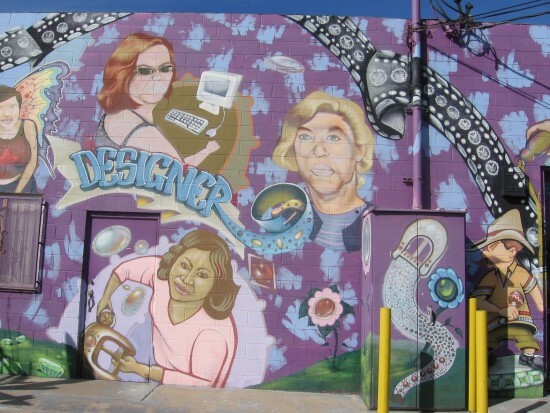 Faces depicted on Kippy’s building in Barrio Logan. 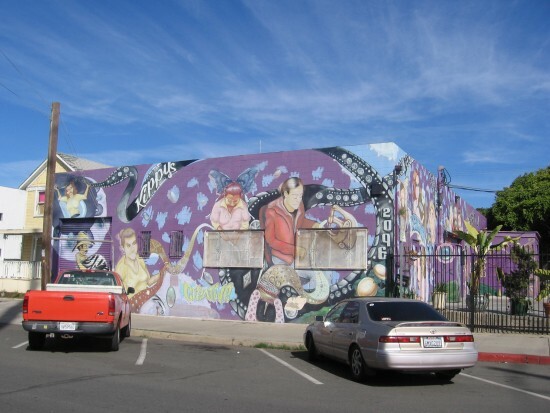 Cool Kippy’s mural in Barrio Logan depicts Mariachis. Posted on December 19, 2013 December 19, 2013 Tags art, barrio logan, cool, creativity, culture, murals, painting, san diego, street art, walkingLeave a comment on Cool mural on Kippy’s building in Barrio Logan. Surreal images transform a Hillcrest sidewalk. The heart’s persistent eye stares out at the city. 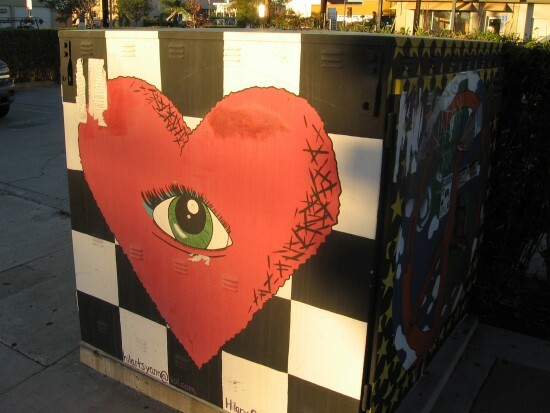 An electrical transformer box on the sidewalk near Sixth and Robinson in Hillcrest has been painted with surreal images. Here are several colorful pics! Surreal image transforms a Hillcrest sidewalk. 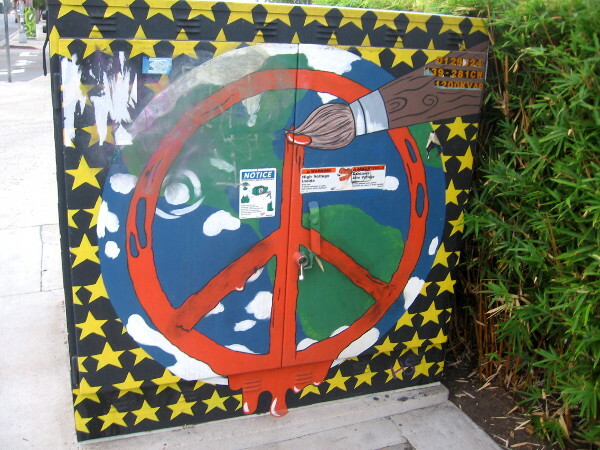 Peace symbol, planet Earth, paintbrush and stars on side of Hillcrest transformer. Posted on December 17, 2013 September 27, 2014 Tags art, artists, bizarre, color, cool, creativity, hillcrest, street art, surreal, urban artLeave a comment on Surreal images transform a Hillcrest sidewalk. Colorful street art in Mission Valley. 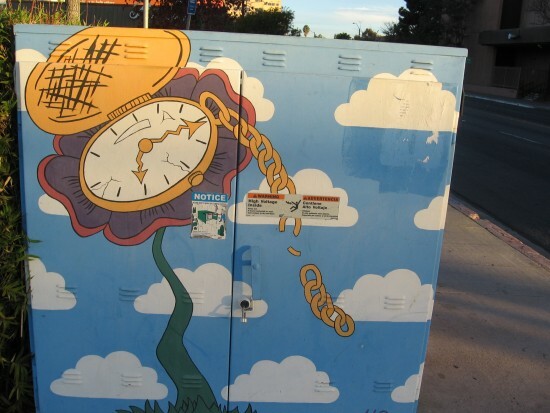 Check out these two photos of utility boxes I spotted while walking to work today in Mission Valley. They sit side-by-side a bit north of the San Diego River on a corner of Camino del Este. 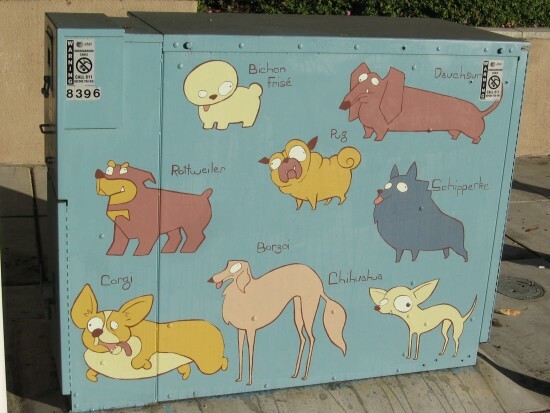 The first box is painted in an amusing fashion with all sorts of dog breeds. Looks like the artist was definitely a lover of canines! This second box is super colorful. I’ve observed that flowers are often central elements in street art. Perhaps people crave a bit of natural beauty in the concrete jungle. Posted on November 13, 2013 November 13, 2013 Tags art, artists, color, dogs, flowers, mission valley, san diego, street art, urban art, walking3 Comments on Colorful street art in Mission Valley. Super colorful street art in San Diego. Check out this cool photo! I captured some more dazzling street art in downtown San Diego, just west of the trolley tracks on Park Boulevard. I like the glassy shine of the eyes and the abundance of color. These fantastic characters seem to have emerged from a little girl’s dream. The right portion was painted by muralist Gloria Muriel, the Bunny Kitty character on the left is by Dave Persue. 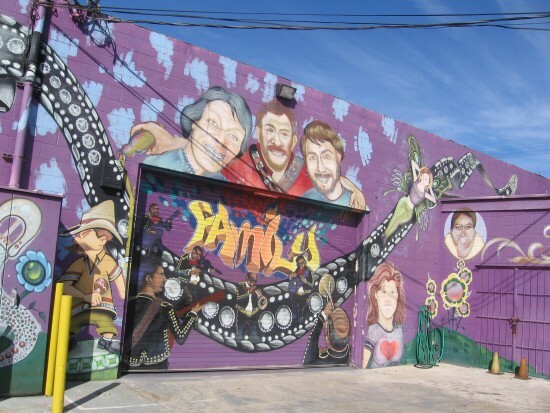 A look at the cool mural looking north. Mural is on the wall of the hART Lounge. Posted on October 25, 2013 July 5, 2017 Tags art, color, cool, creativity, downtown, painting, photography, san diego, street art, urban artLeave a comment on Super colorful street art in San Diego. A crabby waiter serves a surf monkey! 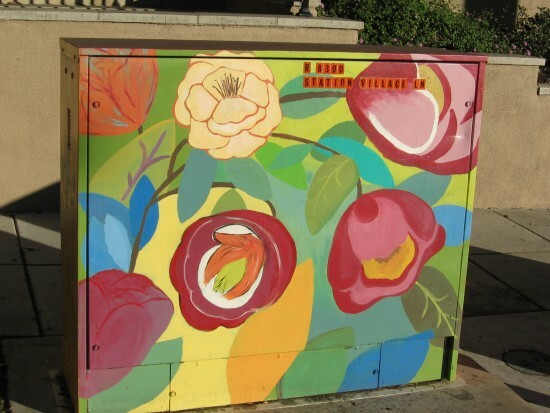 A boring old utility box in Hillcrest was transformed by an inspired artist into a colorful canvas. This fun example of urban art depicts a meditating monkey sitting by the surf, with white clouds and a volcano in the background. He’s being served a beverage by a crab! Posted on October 20, 2013 Tags art, color, fun, hillcrest, monkey, san diego, street art, surf, urban artLeave a comment on A crabby waiter serves a surf monkey! More photos of amazing chalk art at Festa! I promised even more photos of the amazing chalk art creations at Little Italy’s 2013 Festa event. Many of these pics show artists at work, applying vibrant color to the drab asphalt of a downtown San Diego street. Enjoy these images! Andy Warhol might’ve painted mopeds in this fashion! Expressive faces. This was one of my favorites! I also love these exotic masks and faces! What could be more Italian than Pinocchio? Even though it’s a bit creepy, I like this one. It really appeals to the imagination! Among the talented artists were many young people. Impressive! It seems the Minions had a sneaky, dastardly scheme. It was to tilt the Leaning Tower of Pisa! Posted on October 14, 2013 October 15, 2015 Tags art, artists, chalk art, creativity, events, festa, little italy, photography, san diego, street artLeave a comment on More photos of amazing chalk art at Festa! Gesso Italiano artwork on San Diego street. Three blocks of a city street in San Diego’s Little Italy became the canvas for chalk creations! Lots of classical images, as one might expect from a celebration of Italy . . . I bet Walt Disney himself would’ve been delighted by this colorful chalk art Jiminy Cricket! This humorous piece seems to be named Dogue Italia. That’s one elegantly dressed dog! More beautiful artistry . . .
A striking portrait. You’d think this was an exquisite painting hung in a museum! I have even more photos coming . . . so check back soon! 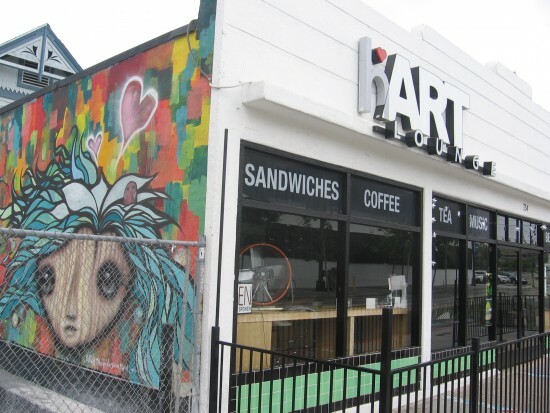 Posted on October 13, 2013 October 15, 2015 Tags art, artists, chalk art, creativity, events, festa, little italy, photography, san diego, street artLeave a comment on Gesso Italiano artwork on San Diego street.